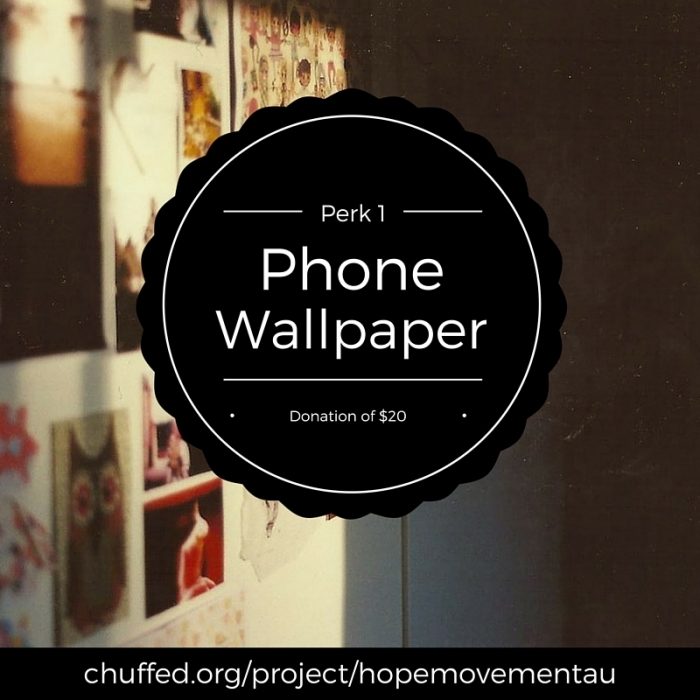 By Hope Movement Au Inc.
Hope Movement is an organisation focused on sharing hope through a community of people. It provides encouragement, information and conversation regarding the topics of mental health, self worth and community. We desire to see people empowered to seek help and have access to community services, allowing them to enter into a lifestyle of physical, mental, emotional and spiritual recovery. 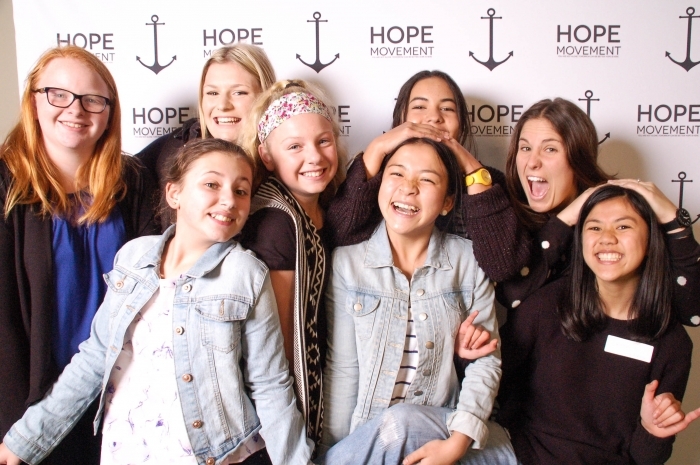 Since 2012, Hope Movement has travelled across Victoria, sharing the message that it’s ok to ask for help.We have seen hundreds of young people empowered to help their friends and find support for themselves in counselling and community groups. Although a lot has been done to raise awareness of mental illness, suicide is still the leading cause of death in Australia for males and females between 15-44. People are battling with anxiety, addictions and abuse alone. As many of you have shared your story with us, one thing has become apparent: when people lose hope, they often don't know where to turn for help and support. Hope Movement fills this gap, and is a conversation starter and a bridge builder for services already in place within the community. 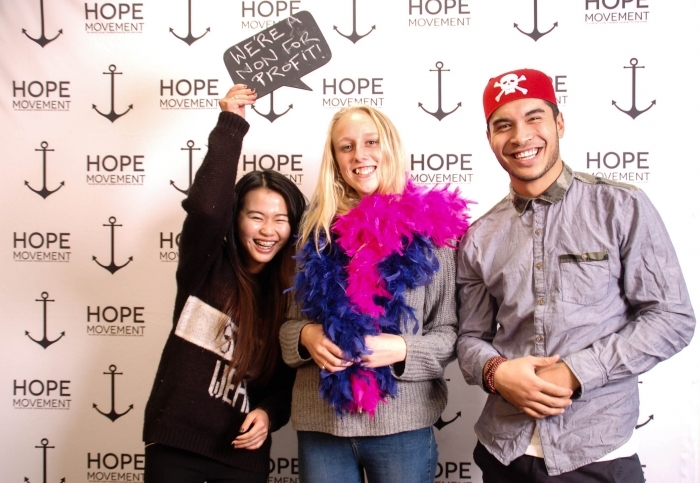 In order to play our part in reducing suicide and providing a sustainable long-term solution, Hope Movement knows it needs to get creative and reach young people in a fresh, accessible, non-threatening way. We need to let people know that they are not alone and that tomorrow can be better. In 2016, we want to let people know that Hope is here. 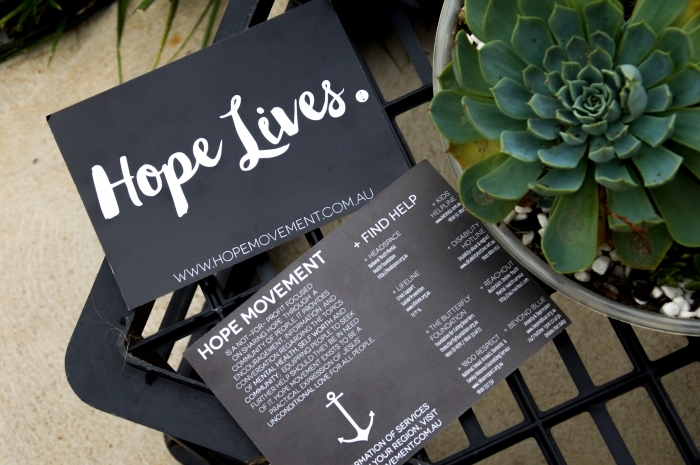 Hope Movement has created a website (www.hopemovement.com.au), giving people access to information about issues like depression, suicide, anxiety and addiction. We use this website to share people's stories on our blog, raising awareness of mental health and pointing people towards help. Our FIND HELP section also lists 24/7 suicide prevention hotlines, and has a Victorian state-wide database of community services, community groups and trained professionals. This expansive database covers every region and catchment in Victoria, allowing people to access immediate and long-term support with the click of a button. 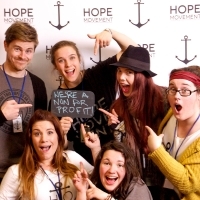 In 2016, Hope Movement is growing even bigger. We need you to partner with us as we take new ground and reach more people with our message of hope and help. We’re looking to grow our street team, launch an International hotline database, and expand our Australian database by developing a credible listing of support services in the state of South Australia. 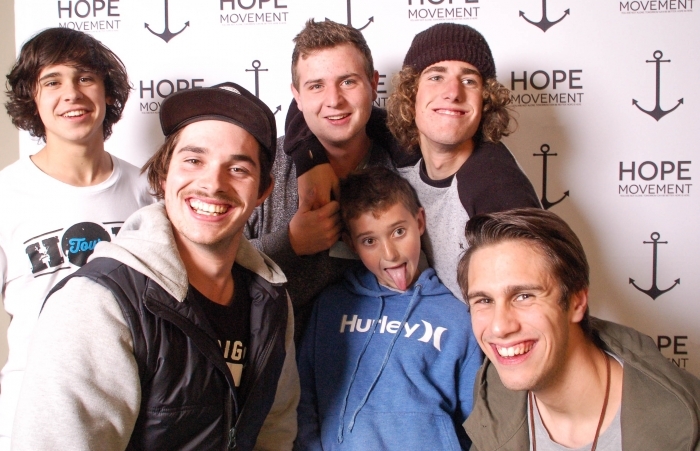 Hope Movement was born and bred in Geelong, and we are still passionate about reaching our community with our message. 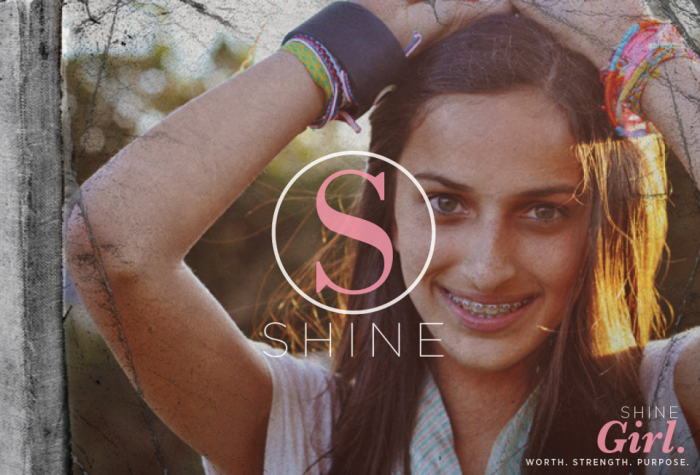 To do this, we will be partnering with Waterfront Christian Church to take the internationally renowned programs, Shine and Strength, into schools. There's only one hitch—Hope Movement is run completely by volunteers, and we rely on donations to fund these new initiatives so we can continue to change lives. How does this change the world? Our Street team will be out in force at schools and youth events throughout Victoria. Their primary goal will be to handing out info cards, which links people to our FIND HELP database and notable crisis hot lines. Our Street Team are often the first interaction of its kind people will have before they ask for the help and begin the journey of recovery. We need to recruit and train a greater amount of team members to become a part of the Hope Movement Street Team, so more people have the opportunity to hear that they are not alone and that help is available to them. In addition to this, the Hope Movement website is being accessed by people all across the world who are seeking information and support. To meet this need, Hope Movement is expanding its FIND HELP database. 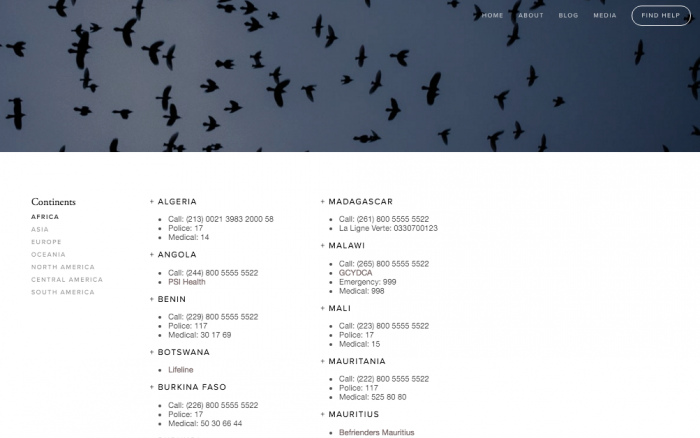 We are launching an expansive international database of suicide hotlines and crisis helplines, so immediate help is available for anyone with access to the internet. 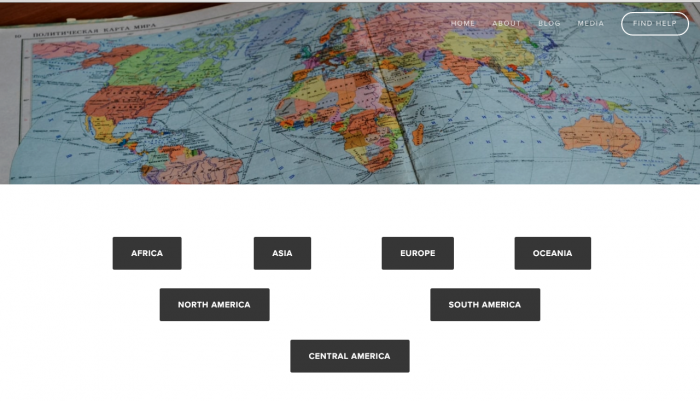 This covers every country in the world across six continents. After seeing how essential our Victorian support services database is, particularly to youth workers and community leaders as they support their own communities, Hope Movement wants to expand this even further. We are creating a South Australian database, listing information about credible organisations, community groups and trained professionals for every region in the state. 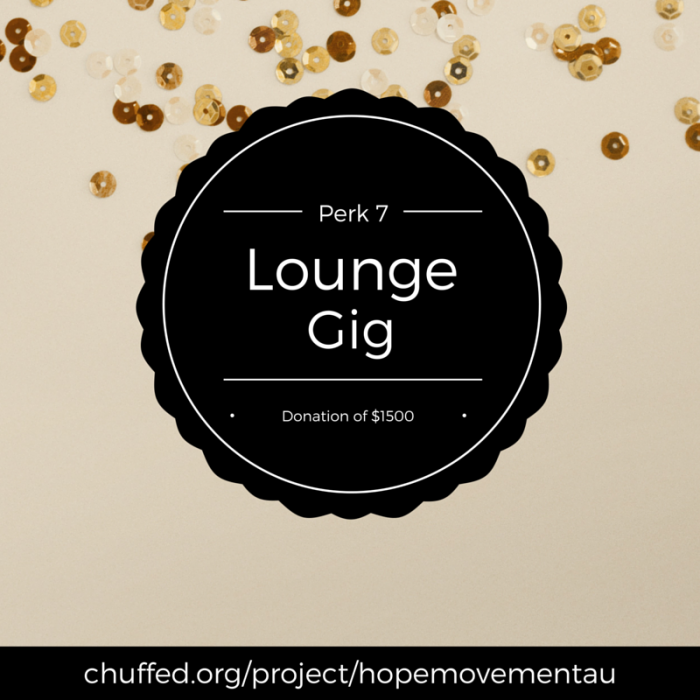 South Australia is full of fantastic services that actively engage and aid people in recovery. We have found that, sadly, many people don't know these services exist. With this new addition to our Find Help database, Hope Movement is going to change this culture. Lastly, Hope Movement is excited to be able to bring the internationally renowned programs, Shine and Strength, to young people in schools throughout Geelong. 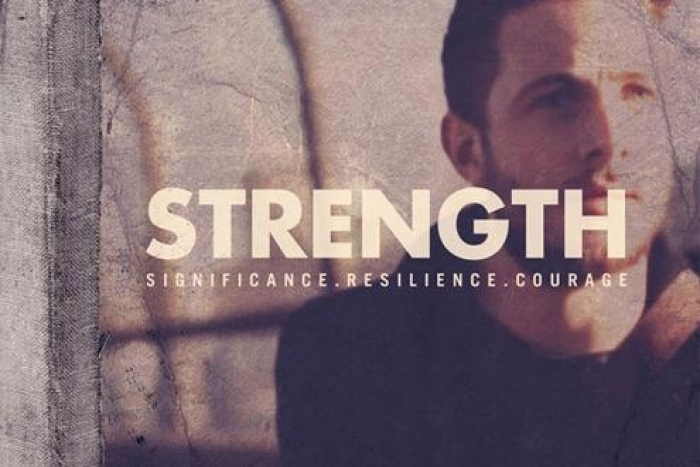 Created by Hillsong Citycare, these programs are unique personal development and group mentoring tools that use an inspirational, practical and experimental approach to learning. The curriculums use a holistic approach to reinforce that every young person is unique and has something valuable to offer the world. Hope Movement is partnering with Waterfront Christian Church to faciltate these programs, creating an avenue for community engagement and providing a pathway for the further mentoring of school students once the program is completed. 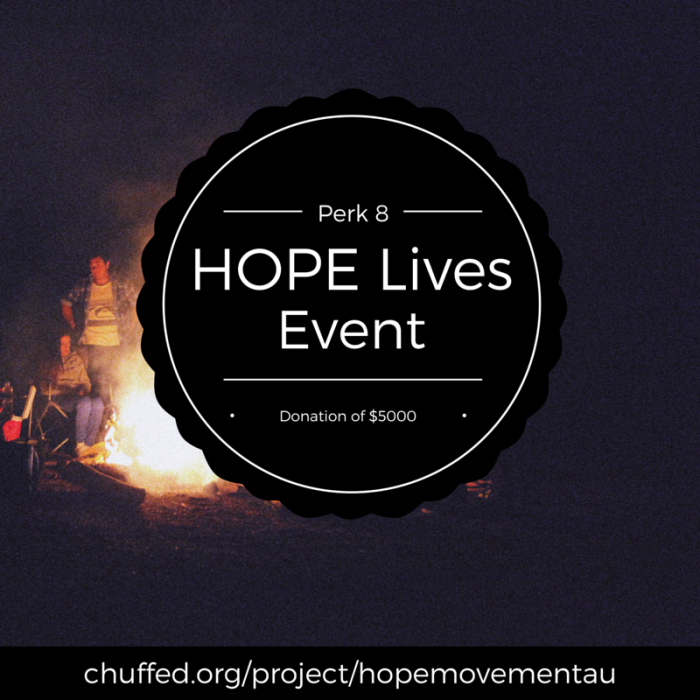 Hope Movement needs to raise $12,000 to take the next step and reach more people with our message of hope and help. 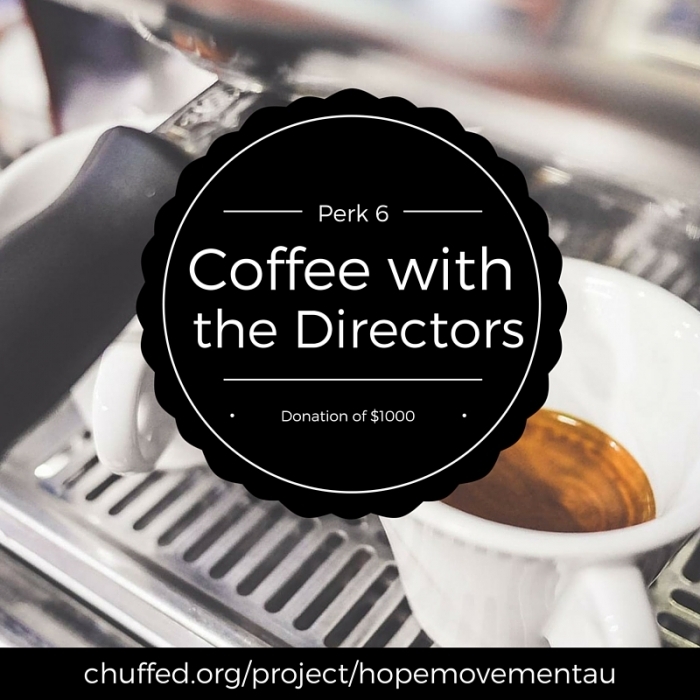 As a community-based organisation, we believe that partnering with you is the best way to not only reach our goal, but ultimately transform the lives of people in communities across Australia and the world. 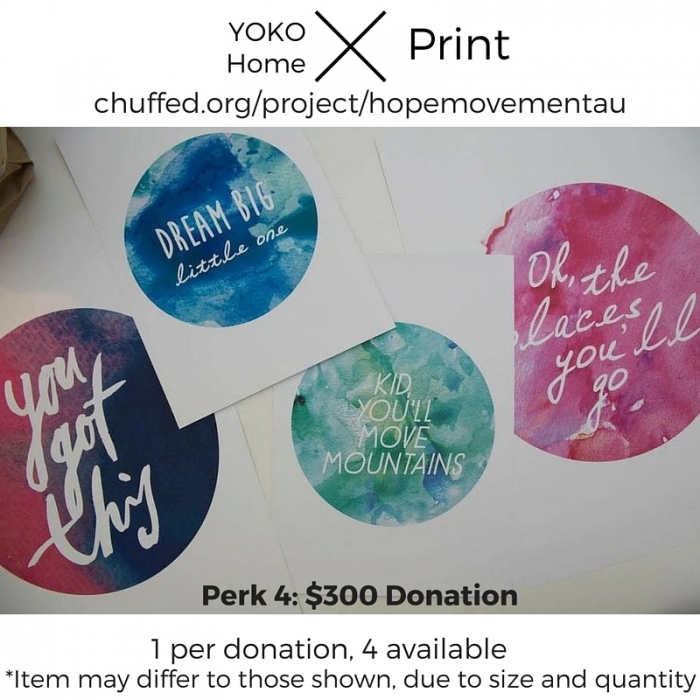 some perks to thankyou for your support! created by Geelong local Ace Carino! Together, we can remind people they are not alone. We are a movement committed to linking people to the help they deserve, and we invite you to join us as we share the message that HOPE LIVES in 2016. 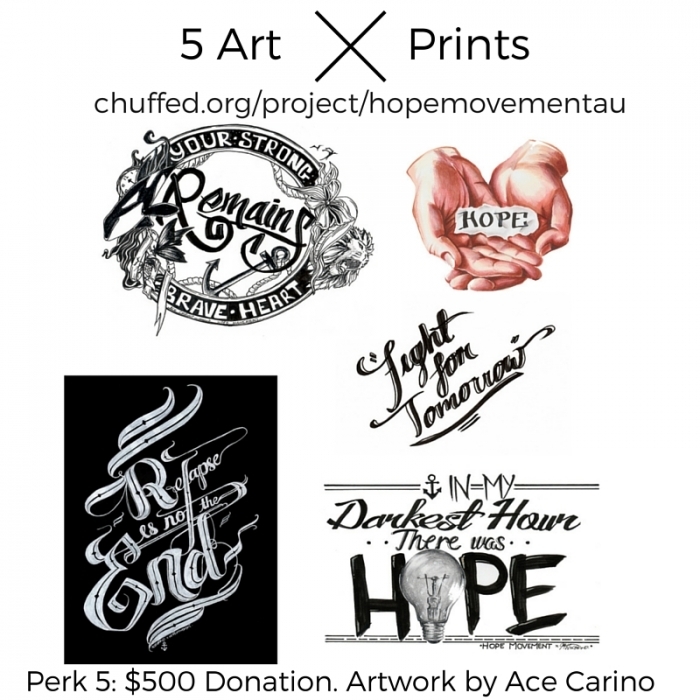 We could not of taken on this campaign without the support of many talented individuals! Actors: Geelong Locals we love you! We'll send you a specially designed phone screen wallpaper, created by Adam Mihail! Receive a limited edition Graphics Pack, designed by Adam Mihail, straight to your inbox! Let us take you out for a coffee! We'll spend an hour and a half with you answering any questions you might have as well as talking about our stories of Hope- and we'd love to hear yours to! Valid in the state of Victoria only, 100km radius around Melbourne CBD. Skype option also available. Invite us around to your home and we'll have a fun night with performances, storytelling and some Q & A. Maximum 25 guests. Available in Victoria only, 100km radius from Melbourne CBD. Skype option also available. 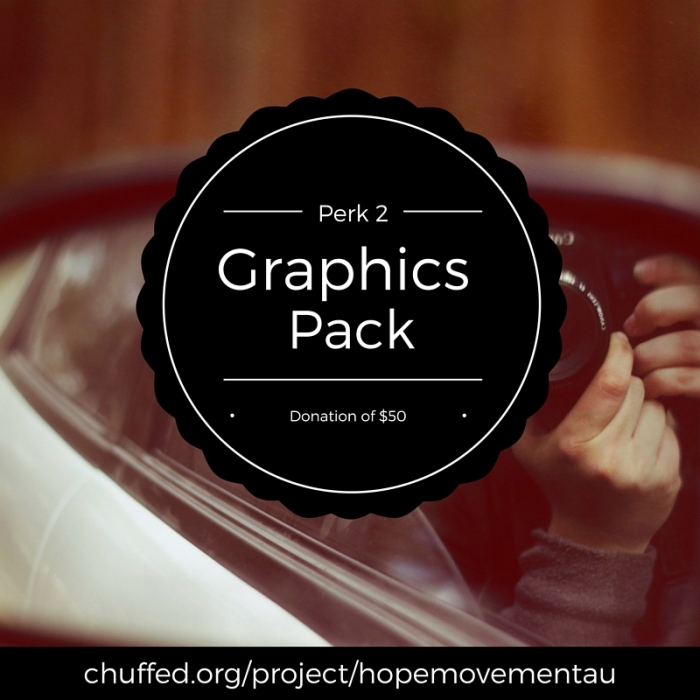 Does your community group, church or school want to join the Movement? 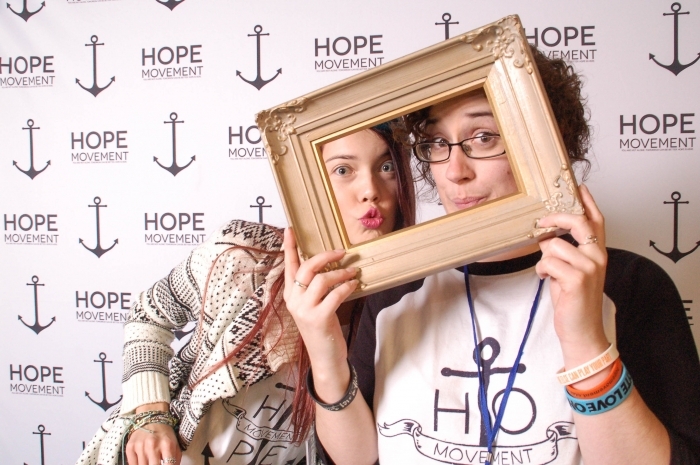 Let the Hope Movement team come to you and host a 'HOPE LIVES' event. We aim to have conversation around the topics of mental health, self worth and community in a relatable and fun way. We'll bring the performers, a guest speaker and the Photo Booth! Want something a little different? We might be able to cater for that to (send us a message to ask!). Everyone's included at a 'HOPE LIVES' event! Valid in State of Victoria only, 100km radius from Melbourne CBD. * $2,667 in offline donations included in total.